A young fishing guide in British Columbia has made a name for himself as somewhat of a sturgeon fish whisperer after landing an 80-year-old legendary sturgeon. Although larger sturgeon have been caught before in the Fraser River near where Nick McCabe landed the recent monster, this particular sturgeon has been a subject of local legend for several decades. That’s because the fish has a distinct deformity on his snout earning it the nickname Pig Nose. The fish is no slouch by any means, measuring 10 feet, 2 inches and weighing roughly 650 pounds. Sturgeon are endangered, however, which prohibits anglers from keeping any big ones. The rule also managed to freeze the record books with a white sturgeon weighing 468 pounds. 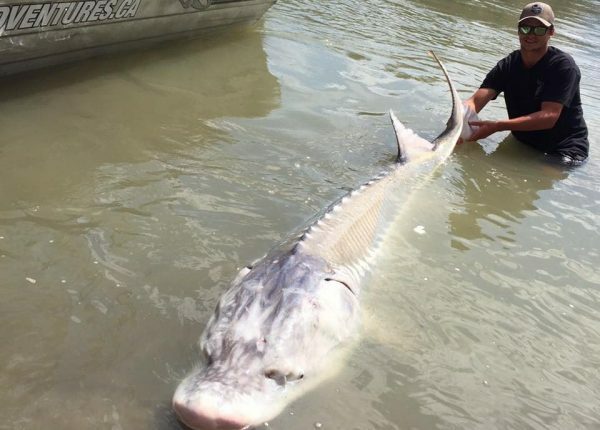 Several sturgeon 1,000-pounds plus have been known to appear in the Fraser River where the giant fish shares a stature among the most notorious river monsters. Sturgeon can live up to 150 years, and were often mistaken for monsters by Native American tribes. McCabe, 19, reportedly landed the giant sturgeon near Lillooet, British Columbia where he works as a guide for River Monster Adventures. He reportedly spent two hours hauling it in.